In 2012, the New York Times released a database of corporate subsidies from state and local sources, a largely comprehensive list organized both by company and state program. This list includes programs used to transfer money, services or tax benefits from government (i.e., taxpayers) to companies. There are two major, related flaws in the New York Times’ worthy effort, though. The Times’ major flaw is assuming that all sales tax exemptions are an example of corporate welfare when, in fact, many are justified economically. In addition, states that transparently and fully report the full value of exemptions, whether or not they are economically justified, see their degree of corporate welfare largesse artificially bloated compared to those less transparent. Texas deserves criticism for its corporate subsidy largesse. However, the New York Times exaggerates Texas’ ranking due to the ready availability of data on the value of sales tax exemptions. Thus, in effect, the Times penalizes Texas for being more transparent. For example, nearly every state offers a manufacturing equipment sales tax exemption — a justifiable tax exemption on economic grounds — but only a few states report the value of that exemption, as Texas does. The same applies to Michigan, where the Times considers the state’s sales tax base on retail goods to be a subsidy for businesses that provide services. The manufacturing equipment exemption is good tax policy because it is an attempt to restrict taxes to the final item sold. This avoids “tax pyramiding,” which occurs when inputs to production are taxed as if they were a final-use good for purchase. By the time the product reaches the consumer, taxes have been applied to taxes and priced into the good. This not only inflates taxes, it also renders them largely invisible to taxpayers. The sales tax that is then applied to a consumer’s purchase results in multiple layers of taxation. As an example, in most states there is an exemption for cars purchased by rental companies. This is because each time the car is rented, the renter pays the sales tax. If there were no exemption, the renter would effectively pay a double sales tax due to higher charges to cover the initial higher cost for the car rental company of acquiring the vehicle. The same reasoning applies to manufacturing equipment or other inputs. The exemption is not given to profit the companies, but to keep consumers from being taxed twice and to prevent market distortions since products with more stages in the production line are disadvantaged relative to those with fewer stages. Preventing double taxation is not a form of corporate welfare. Instead, it produces a tax system that is simpler and more transparent by enabling the end user to easily calculate how much tax they are paying on the final good. It also avoids the economic distortion that would come from a tax system encouraging fewer firm-to-firm transactions at stages of production simply to avoid a bigger tax hit. Taxing every stage of production when transactions occur between firms encourages vertical integration as a tax avoidance measure rather than as a true efficiency-enhancing measure. Our analysis indicates that about two-thirds of the subsidies reported by the New York Times are not truly subsidies; they are actually appropriate elements of tax structure designed to make taxes more efficient and prevent double taxation. These “fake subsidies” include elements such as “freeport” exemptions and accelerated cost recovery systems for equipment and S-corporation write-offs. Many states also have an exemption from the corporate income tax for S-corporations. Taking the New York Times data and removing the entries that are not truly subsidies, we have constructed a new ranking based on what we belief to be a more consistent definition of corporate welfare. 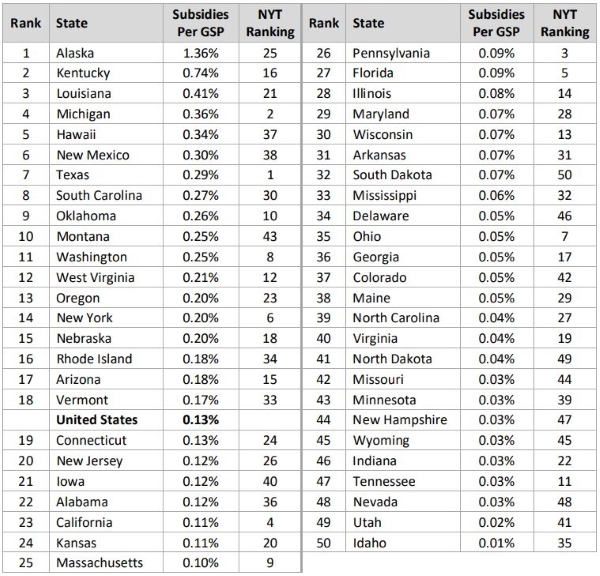 Additionally, instead of ranking states based purely on the dollar amount of the subsidies as the New York Times did, our ranking is based on the size of the subsidies as a percentage of gross state product. This gives a better indication of how distortionary the subsidies may be in each state — large dollar amounts for subsidies may not matter so much in Texas, already a large economy, than they might in Kentucky. This creates a better perspective of the role corporate welfare actually plays in each state and the size of the economic distortions they create in each state. Included in our ranking are cash grant programs like the now-defunct Texas Emerging Technology Fund and bond issue programs or free services given to companies. Also included are exemptions granted to companies targeted specifically at benefiting one company or a small group of companies, such as exemptions or tax breaks for small businesses. Arizona and Oklahoma do not budge much in the revised rankings. However, it’s important to note that our revised ranking actually places them both above California and Massachusetts — two states notorious for trying to micromanage their economy via government policy and business subsidies. Michigan, along with Texas, remains a corporate welfare standout even after the rankings are adjusted. These are only a few examples of how the rankings are impacted by properly accounting for corporate welfare. [*] Rankings are likely still influenced by varied methodologies across states. Half of Texas’ corporate welfare total is in agriculture property tax exemptions, a relative number nowhere matched by other states even though many give similar property tax advantages to farmers. In all likelihood, similarly biased data exists in other areas.